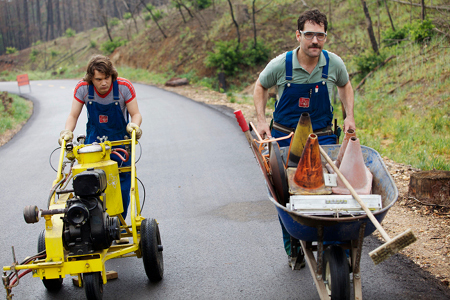 David Gordon Green is back in arthouse form with the lovely and effervescent Prince Avalanche, a methodically paced, gorgeously shot buddy/road trip/ghost story loosely adapted from the Icelandic film Either Way. Alvin (Paul Rudd) and Lance (Emile Hirsch) are stuck out in the middle of nowhere, living out of their tent and highway maintenance truck as they wend their way slowly down an endless ribbon of stagnant highway, methodically painting yellow line after yellow line in a hypnotic rhythm, interspersed with a staccato bang, bang, bang as they hammer metal poles with reflectors alongside the highway, marking their path as they go. They make an odd couple. Alvin, who fancies himself to be smarter and therefore better than the rather dense Lance, studies German on audiotapes, blaring his lessons from an giant boombox as they work, while Lance complains that it’s putting him to sleep. Alvin’s self-righteously set on self-improvement and study; he’s a bookish, reclusive sort of guy, and he’s using this job at least in part, it seems, as a justified way of having space and solitude from his stagnant relationship with his girlfriend, Lance’s sister. Lance, on the other hand, aspires to neither big thoughts nor big dreams, and finds the endless stretches of quiet and loneliness, with no one but Alvin for company, to be excruciatingly dull. Lance’s tastes are simple: he likes beer, comic books, loud music, hot chicks, and “getting the little man squeezed.” He only has this job because Alvin is doing his girlfriend a favor – and perhaps because it makes Alvin feel important to be able to impart his own brand of knowledge and wisdom onto this guy he perceives to be beneath himself. With Lance, Alvin can play the role of mentor — a role, one suspects, that he otherwise has few opportunities to play.